Clue: it’s not a barn. Clue: barns aren’t protected by barbed wire. I love the way you captured the light on the metal roof, and the way it illuminates the rust. Gorgeous! Lots of gold will be made with what they’re growing here. In Niagara! Ok – since you noted the barbed wire, I’m wondering about a prison? If so, you’ve managed to convey beauty in what would be a painful place. The barbed wire is actually to prevent people from getting IN. It’s a greenhouse full of marijuana plants. It was glowing like something alien had landed and I stopped to take a photo of what I thought was just another greenhouse working overtime on a winter’s evening. Well clearly it ain’t the Whistle Stop Cafe — so, starts with W? Wolf-pen for wandering weevil-eating wrong-doers? Other words that come to mind are “woeful”, “wretched”, oh, hey, and “Waltzing Matilda?? ?” I get it! It’s a holding spot for homesick footballers from Oz who sing loudly at all hours. Very mysterious, Carin. 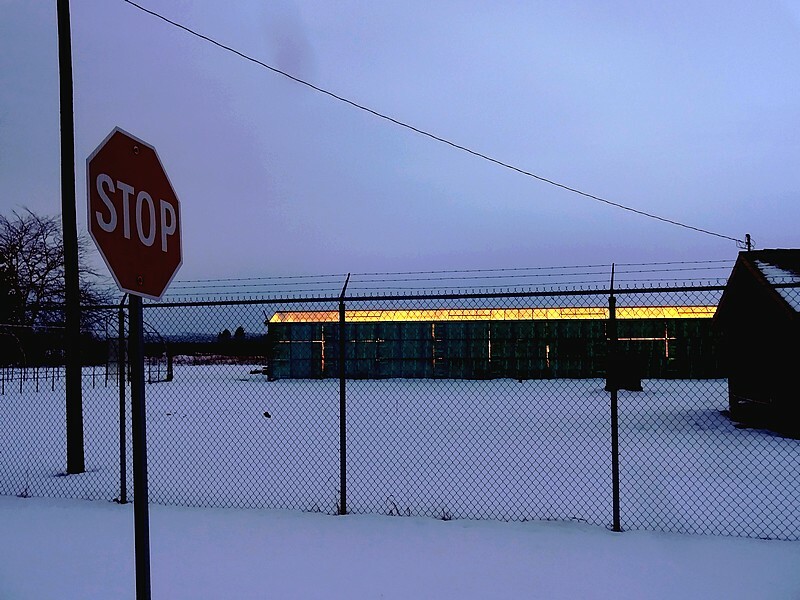 I like the vertical and horizontal lines — the fence, the wires, the stop sign, and of course that shining roof. Is it metallic? Or are there skylights and lights on inside? It’s very nondescript, but the fence suggests someplace protected — people not allowed in … or alternatively, not allowed out! I’m wondering if the Stop sign is symbolic in some way?